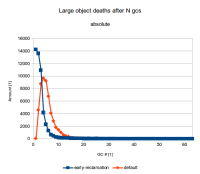 In G1 large objects are always allocated in the old generation, requiring a complete heap liveness analysis (full gc, marking) to reclaim them. This is far from ideal for many transaction based enterprise applications that create large objects that are only live until a (typically short-lived) transaction is not completed (e.g. in a ResultSet of a JDBC query that generates a large result). This results in the heap filling up relatively quickly, typically leading to unnecessary marking cycles just to reclaim them. JDK-8138587 Write tests that test G1 Eager Reclaim.